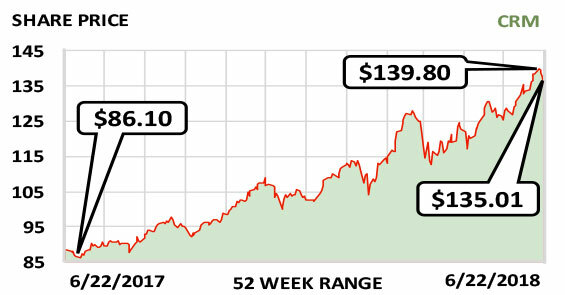 This week’s Stock of the Week is a company that helps its customers help their customers. Salesforce.com Inc. (CRM) offers other businesses cloud-computing solutions to help them with sales, customer service, marketing and other customer relationship management needs. For example, its Sales Cloud accumulates and stores information, monitors leads, and analyzes data to help companies improve their sales…while its Service Cloud connects field agents and dispatchers and helps firms deliver personalized customer service. This is a data-and-technology-driven company whose earnings, although growing steadily, barely show its success because it spends a lot to attract new business and get existing customers to buy more services—and locks in its customers for multiple years once it obtains them. In the 12 months ending January 31, Salesforce generated $128 million in earnings—but an enormous $2.7 billion in cash flow. The firm’s revenue better reflects its size: It was $10.8 billion in fiscal 2018 and is likely to be $12.7 billion in 2019 and $15.2 billion in 2020. Salesforce is so big that its main risks involve small firms perhaps trying to poach some niche elements of its business…and its own need to create more and more top-notch products to generate even higher sales. These are good problems for such a highly successful firm to have. Fiscal year: January. Earnings per share: 2020 est./$1.06…2019 est./$0.88…2018/$0.18.